Afghan officials said Monday that Taliban forces have taken over two towns in the southern part of the country from local forces, while coalition troops said they were investigating reports the insurgents had taken control. One coalition soldier was killed and 11 were wounded, meanwhile, in separate fighting Monday, the U.S. military said. Scores of Taliban fighters on Sunday entered the southern Helmand town of Garmser, bordering Pakistan, and surrounded a police compound, forcing a small security force to flee and then taking control of the area, a local government official said. The official, speaking on condition of anonymity due to policy, said Taliban forces were now "moving freely" around the town and the district of the same name. On Monday, a large number of Taliban militants entered Naway-i-Barakzayi, a Helmand town north of Garmser, and fought a brief battle with police before they too fled the area, said a local police official, who also declined to be identified for policy reasons. A British military spokesman, Capt. Drew Gibson, confirmed insurgent activity in both areas but declined to elaborate. 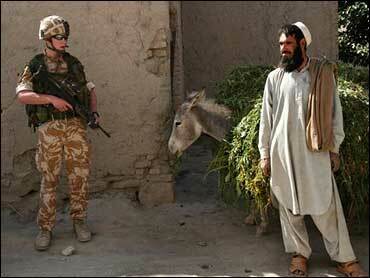 More than 3,000 British soldiers are deploying to Helmand to take over security control from U.S. forces. "We have heard reports of two districts in southern Helmand being under control of the Taliban, and we are in contact with lots of people to build an accurate picture," said another coalition spokesman, Maj. Scott Lundy. The clash that led to the coalition casualties took place in the Tirin Kot district of Uruzgan province after coalition forces attacked and destroyed a truck that extremists were loading with mortar equipment, a military statement said. "The attack was followed by a heavy engagement with enemy combatants," the military said. The nationalities of the dead and wounded soldiers were not released. It was unclear if there were any casualties among the militants. The bloodshed came amid Afghanistan's deadliest violence since the late 2001 ouster of the Taliban. More than 800 people, mostly militants, have been killed since mid-May as U.S.-led coalition forces try to crush resurgent extremist fighters. Also on Monday, officials said a suicide attacker killed two top justice officials and a third employee in their southern provincial office, while coalition troops killed four al Qaeda suspects in the east. A grenade was thrown into a wedding party in southeastern Khost province late Sunday, killing one man and wounding 16, while Taliban militants blew up an empty boys' high school in neighboring Paktika province, police said. The suicide attacker walked into a justice department building in Helmand province's capital of Lashkar Gar and detonated an explosives-packed vest, police said. The blast killed Justice Director Abdul Samad, his deputy, Sher Ahmed, and another employee, along with the bomber, said Ghulam Muhiddin, spokesman for the provincial governor. Nine other people were wounded in the explosion, which destroyed the one-story building, Muhiddin said. A purported Taliban spokesman, Qari Mohammed Youssef, claimed in a phone call to The Associated Press that the insurgents had carried out the attack. Taliban militants have been targeting government officials in a bid to derail U.S.-led reconstruction efforts. In southeastern Khost province, coalition forces killed four al Qaeda suspects and captured three others in a raid targeting an al Qaeda operational leader, the U.S. military said. Three Arab and Chechen fighters and the cleric were killed in a gunfight near the village of Pelan Kheyl, near the Pakistan border, Afghan police said, but it was unclear whether the target was among them. The cleric, Zainullah Buddin, was suspected of distributing propaganda lambasting the Afghan government and its American backers, said provincial police chief Gen. Mohammed Ayoub. In Khost's Bak district, a militant tossed a hand grenade into a wedding gathering at the house of the groom, killing one man and wounding 16 at the male-only party, Ayoub said. The groom was not among the casualties and the motive was unclear. Suspected Taliban militants also blew up a high school in neighboring Paktika province after warning guards to leave the building, said Sayeed Jamaluddin, the provincial governor's spokesman. There were no casualties. The Taliban opposes state-run schools that teach non-Islamic subjects, particularly to girls. Also Monday, a roadside bombing in Helmand province killed three Afghan soldiers and wounded three others as they escorted a supply convoy, said Gen. Rahmatullah Roufi, the Afghan army commander. The bomb destroyed their army vehicle in the Yakshal village of Grishk district.